This information is drawn directly from Kimes and Clark. The Philion was a coal-burning steamer built by circus showman Achille Philion, who had met a lovely Akron girl named Bel Melvin while she was travening in his native France and who arrived in America soon after their marriage. 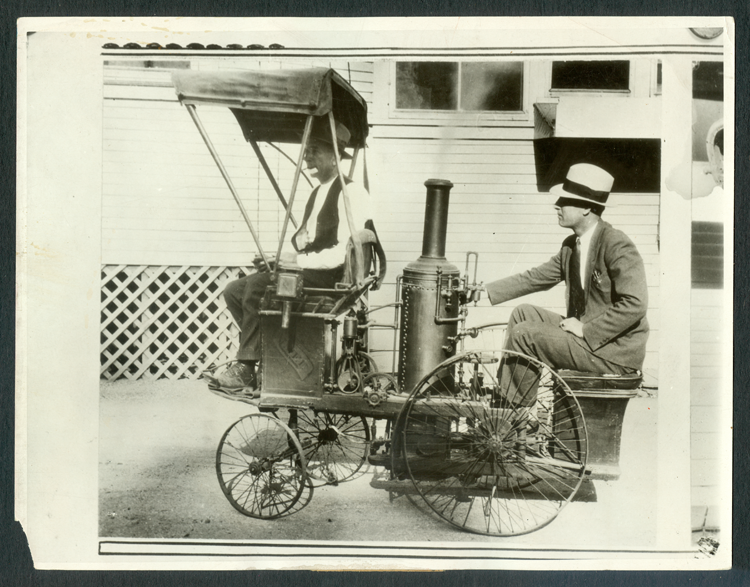 The car was begun in 1887 and was patented and made its first appearance on the streets of Akron in 1892. Philion was by now a featured performer in an Akron-based circus and was widely reputed to bee one of teh finest balancing artists of his time, his specialty walking a rubber ball (naturally, this was Akron, and B. F. Goodrich made the balls) up a spiral tower and then descending iat a great speed in a blaxe of fireworks at the bottom. He built the steamer to call attention to himself and his act, and used it in numerous parageds, which always preceded a circus coming to town. Philion even played the 1893 Chicago World's Fair. In the late 1890s, following a fall while performing in the East, Achille Philion retired from the circus world. He remained in Akron where he opened a movie theater in 1904 and where, in 1907, the Philion steamer was exhibited at Akron's first automobile show. Philion Update – The VSCM was pleased to provide images for the article by Jack Harpster in the Antique Automobile Club of America's Antique Automobile magazine. See: Harpster, Jack, "1892 Philion Steam Road Carriage: America's Most Unlikely Automotive Pioneer," Antique Automobile, Vol. 81, No. 6, November/December 2017, pp. 36 - 41. 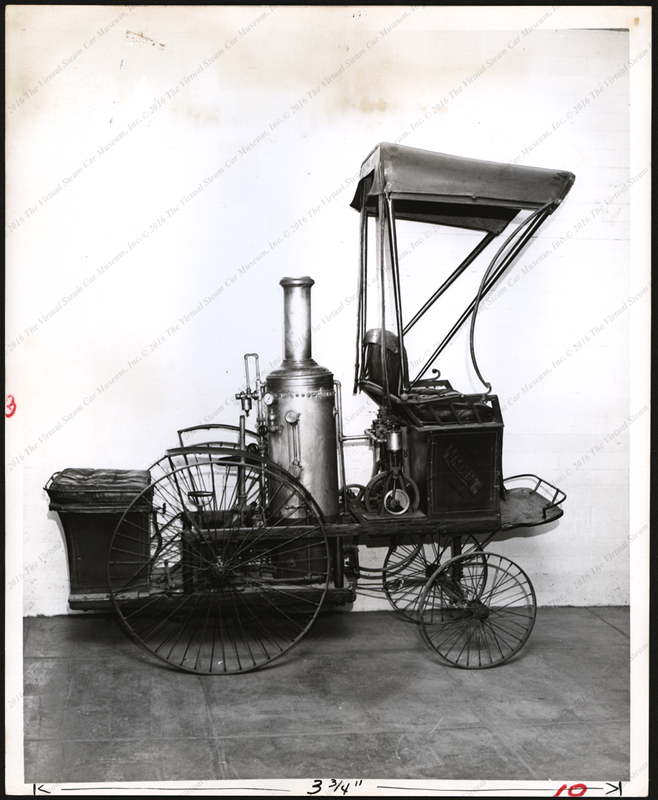 The caption provided by the Los Angeles Bureau of the Chicago Daily News reads as follows: A Nifty Pioneer Motor of 1892 Comes to Light: A Steam Driven Car. Said to have been the first automobile ever seen, in the middle west, was recently discovered in Los Angeles. It was built by Achille Philion, a Frenchman. It required two persons to run it; One to steer and one as engineer. It could do ten milees an hour. Photo shows the ancient chariot. (NY CHI)12/20/30. Photo rec'd 12/20/30. 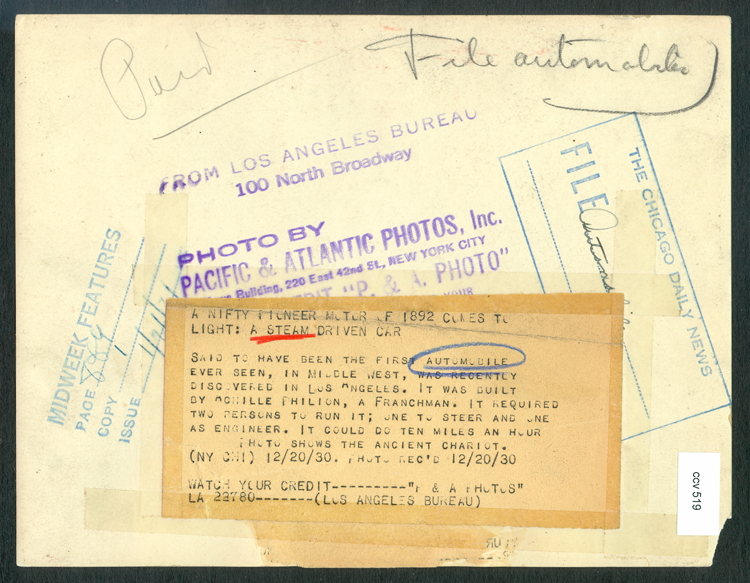 Watch your credit ---------"P & A Photos" LA 22780 -------(Los Angeles Bureau). 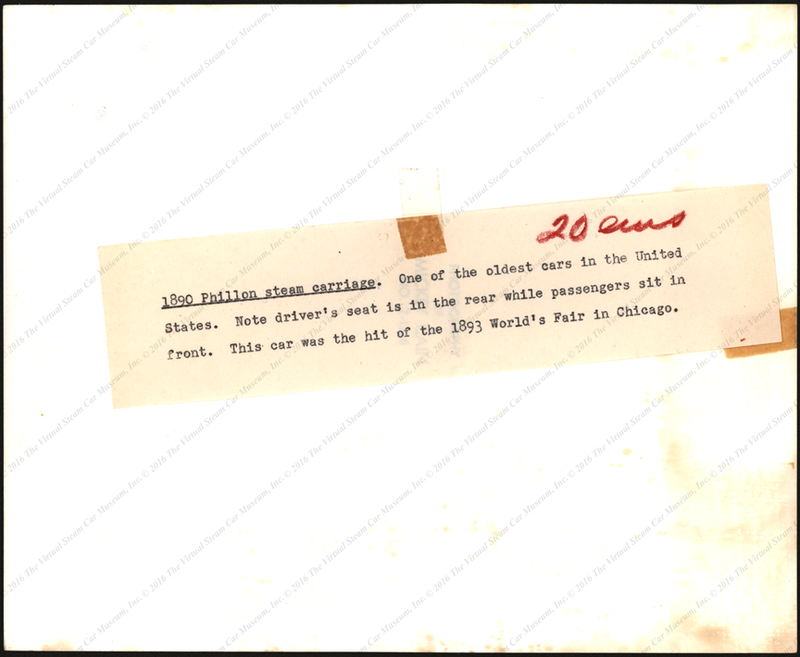 This press photograph is identified as being associated with the Kings of the Road Museum. 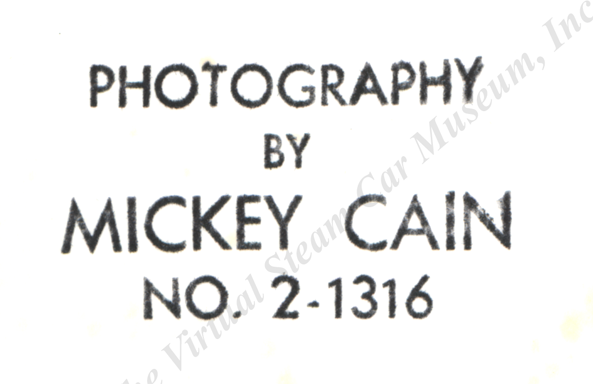 The photographer's name is stamped on the photograph. 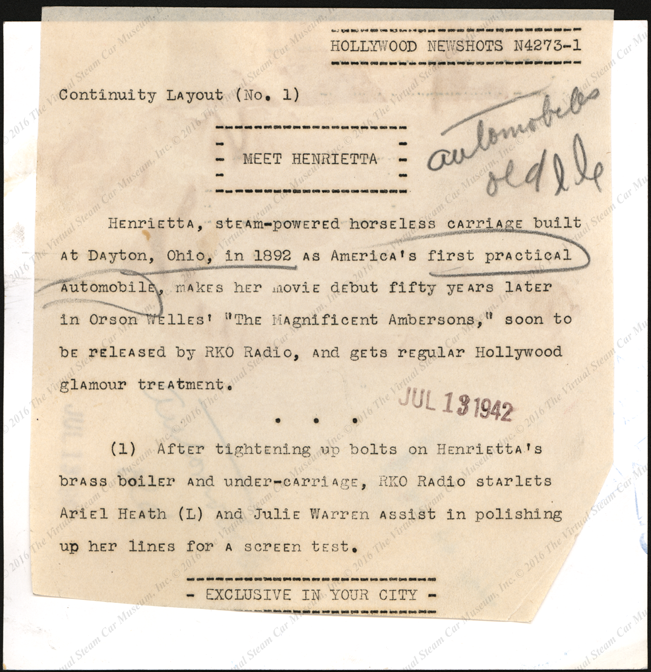 Achille Philion's steam car was resurrected and used in a 1942 Orson Wells film entitled The Magnificent Ambersons. 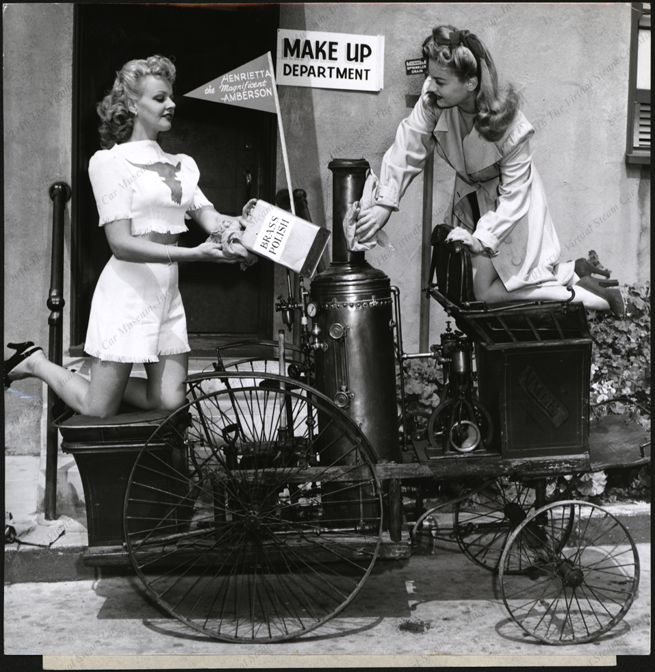 This Hollywood press photograph is dated July 13, 1942. 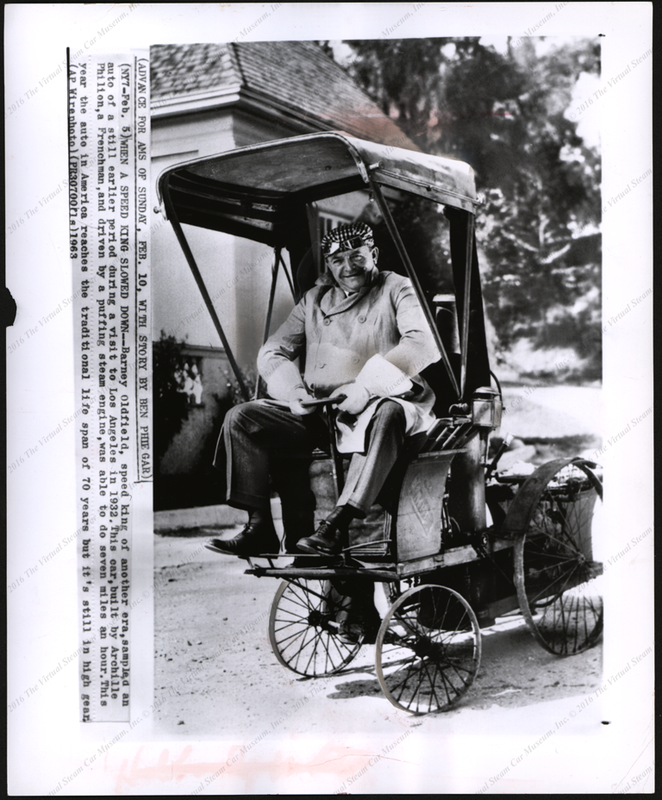 The famous race car driver, Barney Olfield, posed in the Achille Philion's steam car in February 1963. 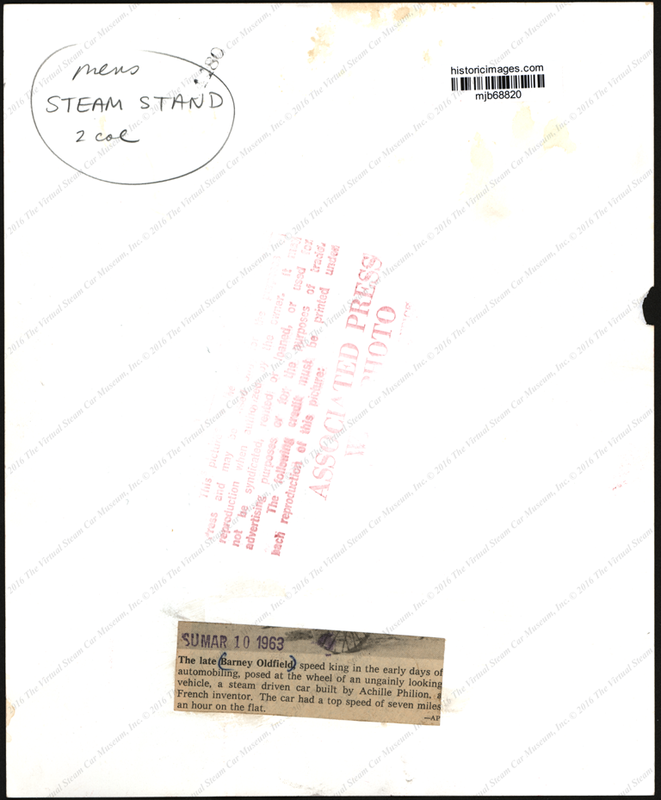 The September 1932 issue of Science & Inventions carried an article about steam cars that featured the Philion. It managed to get the both date, 1891, wrong and the name of the builder, "M. Phelein." Achille Philion secured a patent on September 13, 1892, Number 482,649. Thanks to Jack Harpster for providing this information. Kimes, Beverly, and Clark, Henry Austin, Standard Catalogue of American Cars, 1805 - 1942, 3rd Edition, (Iola, WI, Krause Publications, 1996), p. 1175. Kimes and Clark list no source for this information. Contact us if you have additional information about the Phillion Steam Car or if you have questions.